A new feature in the iPhone 3.0 firmware appears to let users remotely pinpoint a lost or stolen phone by securely requesting the device's location via Apple's MobileMe service. The setting appears under the MobileMe settings page, where push updates for mail, contacts, calendars, and bookmarks are configured. Below these settings is a simple control to activate "Find My iPhone." When activated, the phone opens an alert that says, "this enables the "Find my iPhone" service on your MobileMe account at me.com." It would appear that the service obtains the iPhone's location and makes it available to the MobileMe user on request if the unit is lost or stolen. The rationale for linking the feature into MobileMe is evidently the same as that behind Apple's Back to My Mac feature: security. By only allowing the linked MobileMe account to obtain a location remotely, using GPS or WiFi/cell tower triangulation, users don't have to worry about an outside party being able to track their location. MobileMe supports setting up secure IPSec tunnels between remote clients over the Internet, acting as a catalyst by tracking the locations of MobileMe-registered systems and securely publishing their location to other MobileMe-registered devices using Wide Area Bonjour. 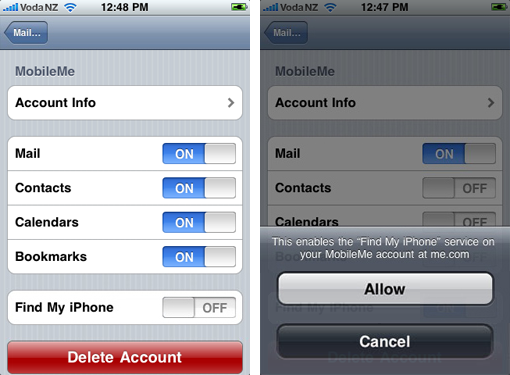 In this case, the iPhone would simply give its registered MobileMe user the option of remotely requesting its location. The settings to support the new feature are not yet visible on the MobileMe website, as the iPhone 3.0 firmware is currently still in developer release and won't ship until this summer.